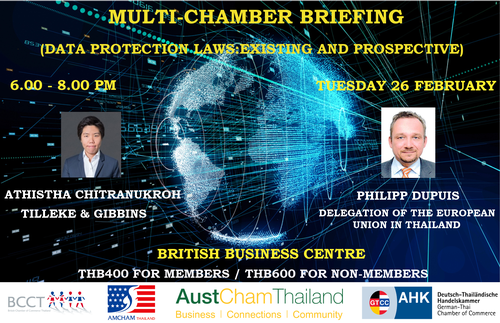 AMCHAM, in collaboration with the BCCT, AustCham and GTCC, invites you to join our briefing on Data Protection Laws. In May of last year, the new EU data protection laws came into force, with sweeping implications for businesses worldwide. Now Thailand stands on the brink of enacting data protection laws of its own. On the evening of 26 February at the British Business Centre, two distinguished speakers will address these developments. Philipp Dupuis, Head of the Economic and Trade Section of the Delegation of the European Union in Thailand will speak on how the EU’s new laws affect business in Thailand. Athistha Chitranukroh, Partner at Tilleke & Gibbins, deputy director of their corporate and commercial group, and joint head of their technology industry group, will speak on Thailand’s draft Data Protection law. Price includes finger food, soft drinks, beer and wine.